Join your friends from St. John Lutheran Church in Roanoke at Camp Bethel! Elementary Resident Camp is 6 days and 5 nights of fun, fellowship, and lots of adventure. You will lodge in a gender-separated cabin and spend each day with your co-ed family-unit of 10-12 campers and 2-4 counselors. You and your unit will plan your week’s activities including swimming, group games, crafts, nature lessons, creek-play, parachute games, archery, climbing wall, orienteering, camping skills, group challenge & initiatives course, GaGa Ball & 9-Square, Morning Watch, Bible study, special evening programs, night activities, skit night, daily group duties, daily “Voice Your Choice” Unit activity, hiking the camp trails and a singing-hike to Horseshoe Bend, polar bear swims, hosting meals, and nightly worship around the campfire. On Tuesday or Wednesday your Unit will have a cook-out and overnight camp-out in your Home-in-the-Woods (see opt-out info below). Be here for an awesome week! ​Price = $350. St. John Lutheran Church is paying $100 of the cost of this program! You pay $250! ​Scholarships are available through St. John Lutheran Church. For more information please contact Kristie Robers at 540.774.0712 or kristie@stjohnlutheran.org. 3. Get your Confirmation Packet: After submitting your Registration Form, ​your browser will direct to Camp Bethel's Confirmation Packets page (for you to print). We'll also send you an e-mail with links to your packet which includes your gear list, a required Health & Camper Info Form (to be completed and returned to Camp Bethel), your Balance Due (if any), and important information about your program. Please notify the camp office 540-992-2940 or CampBethelOffice@gmail.com in advance if your camper will not attend this session. Campers are expected to attend this camp in its entirety. Late arrival and early departure is discouraged, but allowed in case of illness, family emergency or conditions beyond control. 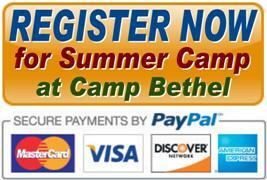 (1) Your $50 deposit is non-refundable unless Camp Bethel cancels the camp program. (2) A $20 processing fee must be added if you choose to switch or reschedule your camp date. (3) If complete payment of the camp fee (or scholarship approval or Good-As-Gold form) is not received 14 days prior to your camp date you will forfeit your reserved spot. (4) There are no refunds for cancellation of reserved spot in camp within 14 days prior to your camp date. (5) There are no refunds for partial camp attendance or early departure for any reason unless Camp Bethel cancels the camp program.